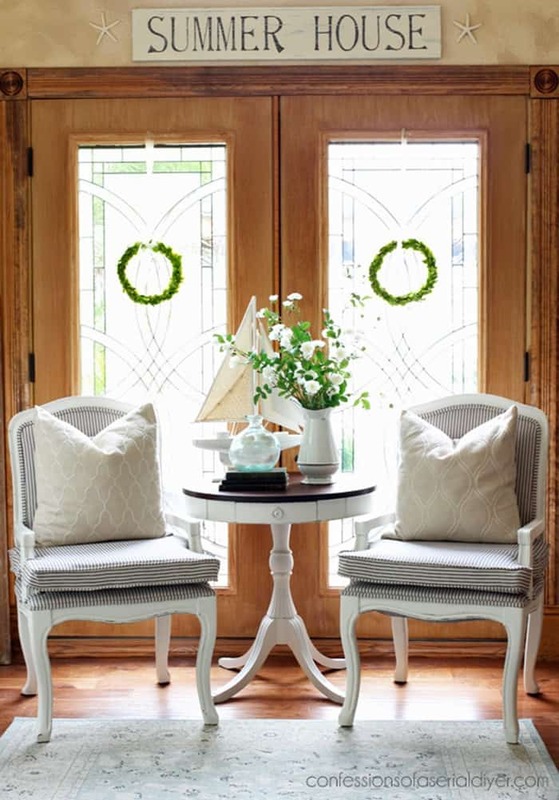 The furniture fixer upper makeovers today are the best of the best. There are several project ideas I’ve never tackled and some I’m never going to tackle. The first photos are my favorites from the group and then we have the links to this month’s makeovers at the end of the post. This is one I’m not tackling. I have no desire to upholster or reupholster furniture of any kind. 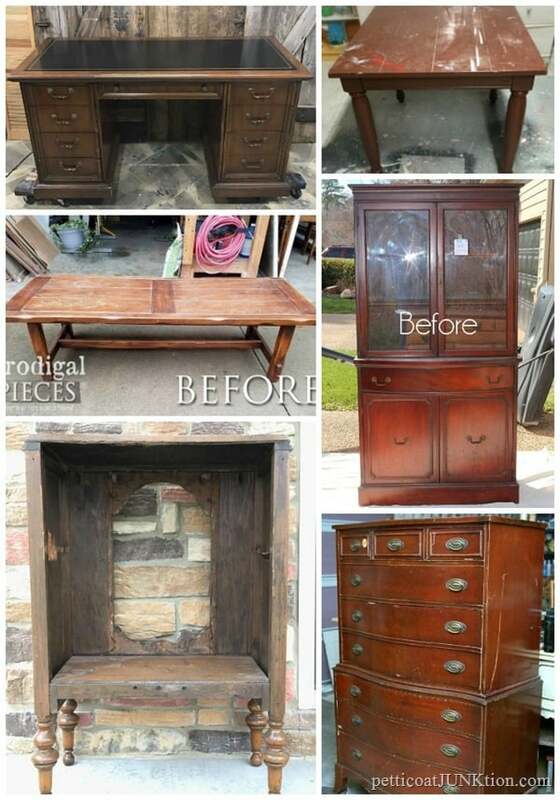 But I do love a good upholstery makeover. Christy has one of my favorites. The chairs are covered with blue and white ticking and the white paint is distressed. The price for the chairs was pretty good and the fabric cost was even better. 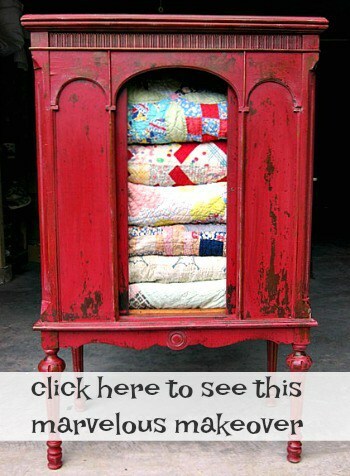 The chest of drawers by Jen makes me happy. 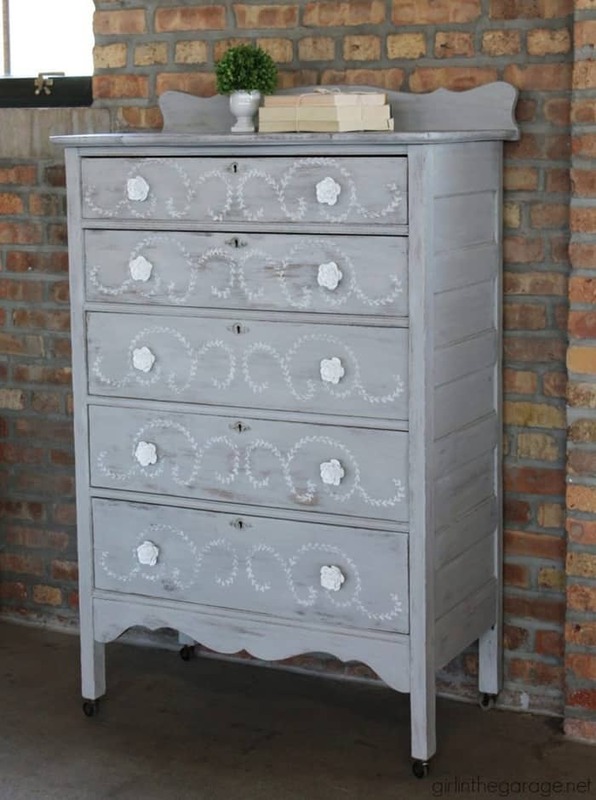 I love the stenciled design and the white rose pulls are perfect for this piece. The stencil is from Miss Mustard Seed. I didn’t even know she had a line of stencils! You really have to see what Larissa started with to appreciate this makeover. 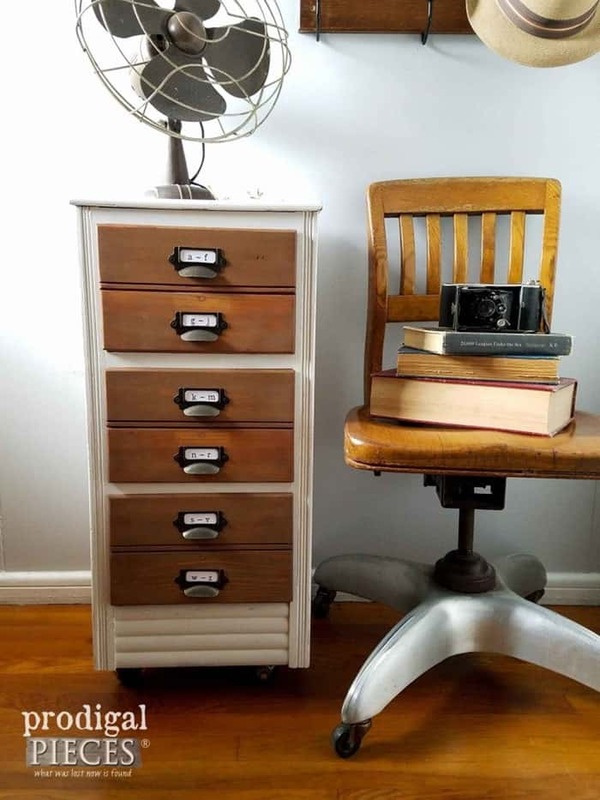 How she turned the file cabinet into an Apothecary Cabinet is a true labor of love. I would like to try something similar. I just need to find the perfect candidate and some of those label drawer pull thingies. Marie knew she had me on this project with all the bright colors. How she managed to get those stripes just perfect even with tape is beyond me. And if you look closely you can see where she outlined those stripes with gold marker. Although the gold lines don’t grab you they make all the difference in the world. Took this piece to designer level. The metallic finish on the chest looks so smooth I just want to touch it. But my favorite part of the makeover is where Kandice painted the sides and insides of the drawers teal blue. You guys might remember this makeover. It’s mine and my favorite of the year. I loved this chest on chest so much after the makeover I moved it into our master bedroom and moved the old chest out. The horribly stained original hardware was cleaned up with Bar Keepers Friend. That stuff is a miracle worker. Someone told me Brasso would work just as well but I tried it and it didn’t. Maybe I just have tough hardware. For the stripe I taped it off with FrogTape painters tape and used Rustoleum Rose Gold Spray Paint. This is one of those projects where I changed plans or maybe I didn’t have a firm plan to start with. 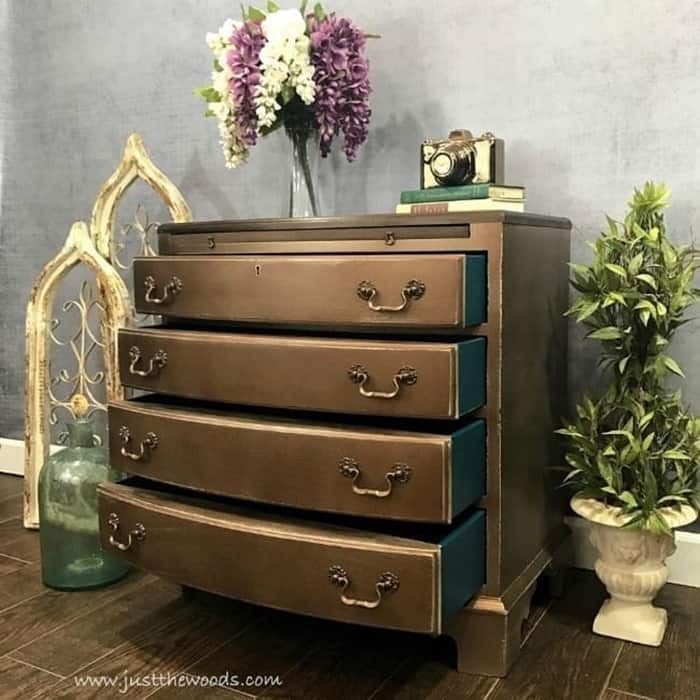 I thought of painting several of the drawers gold or maybe just a couple of them gold but I like how it turned out with the one stripe. Time to see what my talented Furniture Fixer Upper Friends have for us today. 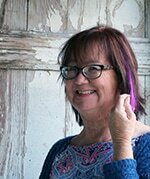 Just click the pink links below the “before” photo collage. 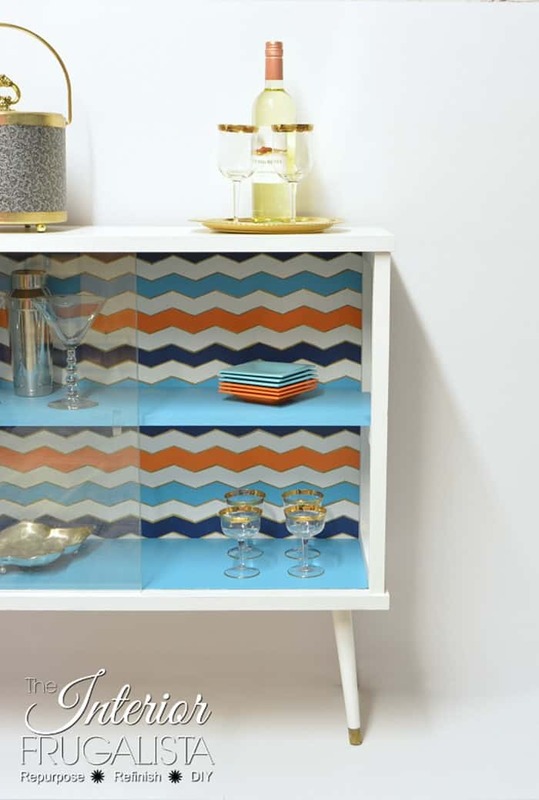 If you’re up for one more project see the other piece I painted stripes on. But it’s striped all over and it’s red! Here it is……Pure Hi-Gloss Red and White Chest. Hard to pick a fave. They all look great! Love the new profile picture of you too! Have you had that up there long and I just haven’t noticed! You are the cutest thing since the color pink. ah, thanks Cindy! Getting wild and crazy in my old age. I told hubby the real me is coming out. He said he’s known the real me for a long time now everyone else will. 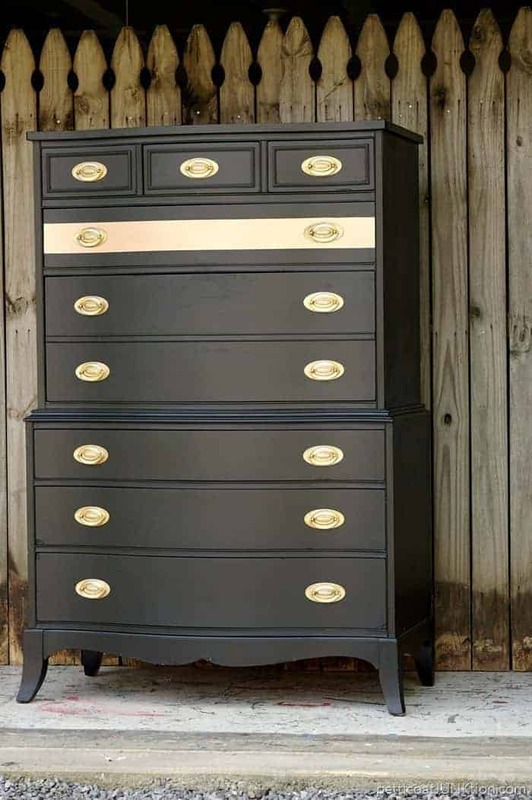 This dresser is definitely one of my favorites of yours from the group too – the pop of gold is stunning! Thanks for giving my funky bar some love – I just sold it a few weeks ago to an adorable young couple who just bought and renovated their first home. What a year it has been! You certainly rock the DIY, Kathy. Here’s to a new year!